The ACLU Foundation of Southern California, the ACLU Foundation of Northern California, and the National Immigrant Justice Center (NIJC), along with the international law firm Reed Smith LLP, filed a class action lawsuit in the Northern District of California on behalf of thousands of immigrants fleeing persecution who have faced months of detention while they await reasonable fear determinations, the first step in seeking protection in the United States when someone is forced to return following a deportation order. Department of Homeland Security (DHS) interior enforcement programs have taken at least two million immigrants from their communities, including many long-time U.S. residents, since President Obama took office. Many left behind families in the United States and were deported to countries that have become extremely violent and unsafe. Others were more recent asylum seekers who attempted to seek protection the first time they crossed the border but were caught up in fast-track border deportation processes and quickly deported without having their fear of return acknowledged. When these individuals reenter the United States, they usually face one of two scenarios: their previous deportation orders are reinstated and they are removed without an opportunity to see a judge, or they have an opportunity to express their fear and are detained and placed into the reasonable fear process with hopes that they may be allowed to see a judge. Plaintiffs seek, on behalf of themselves and a class of similarly-situated immigrants, an order requiring the government to conduct reasonable fear interviews and issue reasonable fear determinations within the mandated 10 days and without unreasonable delay. The suit was filed in the U.S. District Court for the Northern District of California in San Francisco. On Nov. 21, 2014 a federal judge rejected the government's motion to dismiss and granted the plaintiffs' motion for class certification. A settlement was reached on July 8, 2014, but parties are awaiting approval of the settlement by the count before the settlement becomes effective. 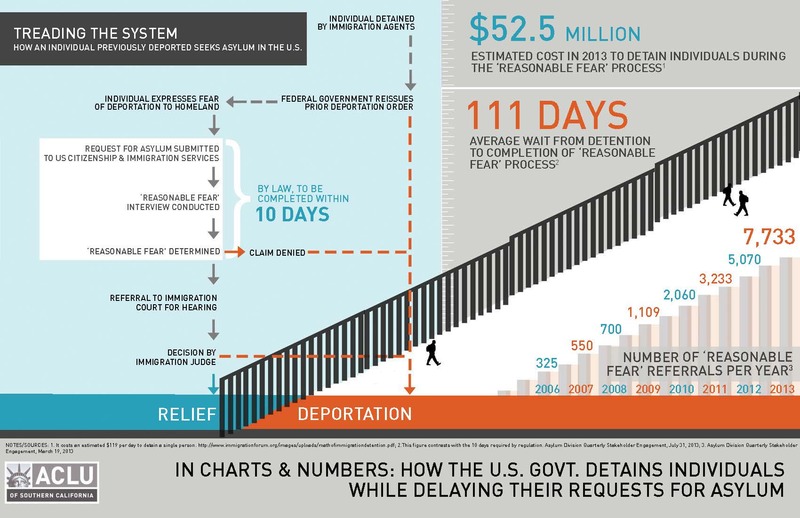 Under the settlement, individuals who express a fear of persecution in their home countries and who must go through the “reasonable fear determination” process will have their case referred to USCIS within an average of five days, and USCIS officials must decide whether that fear is reasonable within an average of 10 days from the time the case is referred. On Oct. 27, 2015 the court granted final approval fo the parties' Settlement Agreement. The Settlement Agreement will ensure that the government processes “reasonable fear” determinations expeditiously and end its practice of needlessly detaining asylum seekers for prolonged periods while they await determinations in their cases. This advisory provides background on the Alfaro Garcia suit and an overview of the provisions of the Settlement Agreement. If you have questions about the Settlement Agreement, please contact Plaintiffs’ Counsel at AlfaroGarciaSettlement@aclusocal.org or via mail at: Alfaro Garcia Settlement, 1313 West 8th Street, Los Angeles, CA 90017.